Red blood cells (also known as erythrocytes) are cells in the blood that carry oxygen to all parts of the body. They are made in the spongy marrow inside the large bones of the body. Bone marrow constantly makes new red blood cells to replace old ones. Normal red blood cells last about 120 days in the bloodstream and then die. Their main role is to carry oxygen, but they also remove carbon dioxide (a waste product) from cells and carry it to the lungs to be exhaled. White blood cells are the type of blood cells that fight infection in the body by seeking-out and destroying disease-causing microorganisms. Also known as leukocytes, the white blood cells are responsible for maintaining the immune system’s response to foreign substances and infection. They play a number of roles in immune response, including antibody production, attacking and destroying cancer cells, and producing substances that kill tumors. They are divided into many different categories on the basis of their functions and appearance. Thrombocytes, or platelets, are not complete cells, but are small fragments of very large cells called megakaryocytes. Megakaryocytes develop from hemocytoblasts in the red bone marrow. Thrombocytes become sticky and clump together to form platelet plugs that close breaks and tears in blood vessels. They also initiate the formation of blood clots. The production of blood cells, is called hematopoiesis. Before birth, hematopoiesis occurs primarily in the liver and spleen, but some cells develop in the thymus, lymph nodes, and red bone marrow. After birth, most production is limited to red bone marrow in specific regions, but some white blood cells are produced in lymphoid tissue. All types of formed elements develop from a single cell type — stem cell (pleuripotential cells or hemocytoblasts). 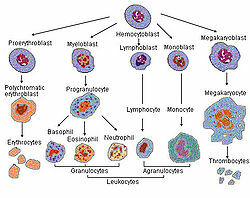 Seven different cell lines, each controlled by a specific growth factor, develop from the hemocytoblast. When a stem cell divides, one of the "daughters" remains a stem cell and the other becomes a precursor cell, either a lymphoid cell or a myeloid cell. These cells continue to mature into various blood cells. Misshapen red blood cells characteristic of sickle cell anemia. Sickle cell anemia is a serious circulatory system disorder affecting the integrity of red blood cells. Its name is derived from the shape of the cells, which become round and flat resembling a sickle. Normal red blood cells are smooth and round and move easily through blood vessels to carry oxygen to all parts of the body. Sickle-shaped cells don’t move easily through blood because they’re stiff and sticky and tend to form clumps and get stuck in blood vessels. 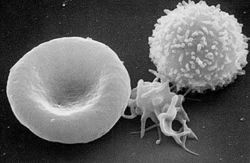 The clumps of sickle cells block blood flow in the blood vessels that lead to the limbs and organs. Blocked blood vessels can cause pain, serious infections, and organ damage. ↑ Blood cell Wikipedia. Accessed January 4, 2012. ↑ 2.0 2.1 2.2 What Is Sickle Cell Anemia? by the National Heart Lung and Blood Institute. ↑ Composition of the Blood National Cancer Institute. Accessed January 3, 2012. Author unknown. ↑ 8.0 8.1 Blood Cell Lineage National Cancer Institute. Accessed January 3, 2012. Author unknown. ↑ About Sickle Cell Disease Sickle Cell Disease Association of America, Inc. . Accessed January 4, 2012. This page was last modified on 3 August 2014, at 16:25.